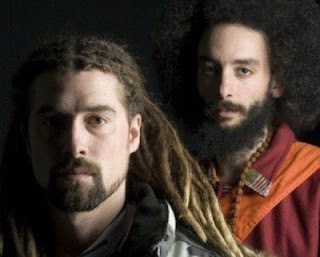 Conspirituality is a revolutionary, spiritually conscious and politically charged hip-hop group from Vancouver, British Columbia. The group consists of three members, Gemineye and Zaddik Melchizedek with BigBrother accompanying them on beats and percussion, providing the soundtrack to Gemineye & Zaddik’s lyrical motion pictures. Gemineye concentrates mainly on revealing the ugly faces of the powers that be. Even the staunchest non—believers have witnessed Gemineye use calculated intelligence to turn so called conspiracy theories in to stone cold facts before their vary eyes. These conspiracy facts include such white-hot topics as 9/11 Truth, Bohemian Grove, The Illuminati and the Princess Diana Assassination. Meanwhile Zaddik Melchizedek takes focus and sheds light on ancient world traditions, cultures, mythologies and beliefs. Unlocking secrets buried deep beneath the sands of time and displaying them in the bright sun of today for this generation’s hip hop community. Conspirituality can constantly be found incinerating stages and blowing away audiences from their local Vancouver all the way to the Eastern Seaboard. They have toured, performed, and collaborated with such artists as Sweatshop Union, Kyprios, Moka Only, Josh Martinez, Kia Kadiri, Zion I and Ndidi Cascade. In September 2008 Conspiratuality released their limited addition EP titled ‘Evil Politicians’ to coincide with their cross Canada tour culminating in Ottawa with a march on Parliament Hill alongside the Vancouver 9/11 Truth Movement to demand the Canadian government investigate the deaths of 24 Canadian citizens who perished on 9/11/01. Shortly after the Evil Politicians Tour, Conspirituality with the help of DJBALL from We are Change Vancouver produced and released their controversial video for the anti George W. Bush themed track titled ‘Ambushed’. This video became an instant Internet sensation and received mention in anti New World Order author Mark Dice’s book ‘The Illuminati Facts & Fiction’ published in April 2009. In June 2009 Conspirituality released their self-titled double disc album consisting of Gemineye’s ‘Ripples in the Pond’ and Sons of Zadok’s ‘Nazarene Vow’. This magnificently packaged 28-track masterpiece was recorded under the watchful eye of JT420 at Paranoyd Sound Studios and released on the independent record label Inner Earth Music. Conspirituality is a pioneering form of hip hop embodied by a group who no matter how many albums they sell remain so underground, they’re Inner Earth!! !